Meadow Glen community is sold out and is not in active development by builder. 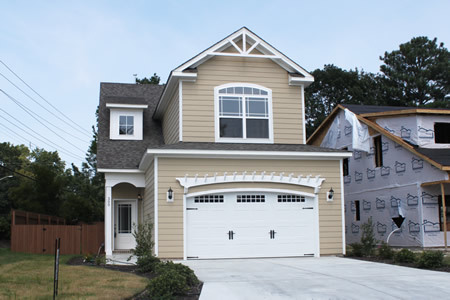 If you are interested in Meadow Glen or similar new home communities, contact us today! Our agents are very familiar with new and newer construction in Virginia Beach, and can identify resale opportunities in Meadow Glen, as well as builder inventory available in nearby or similar communities in Virginia Beach. To view 6 more pictures, interactive maps and the full, detailed description of the Meadow Glen community, please Login. Looking at the new construction properties in Meadow Glen, homebuyers will have no trouble finding just the right new home. This real estate development gives buyers of Hampton Roads the homes they want at prices they deserve. Tucked into a quiet nook of Virginia Beach, VA, these homes are nicely appointed to meet modern demands. Military bases like NAS Oceana, Joint Expeditionary Base Little Creek-Fort Story and Dam Neck are just minutes away, making this a central location for any service member. The beauty of new construction is showcased throughout each of these 11 properties. Fresh paint and new materials can smell like a dream come true to buyers who have played the remodeling game. Houses here start at around 1,800 square feet giving ample living space for families of all sizes. Each home at Meadow Glen may feature a three-car garage, ceiling fans, ceramic tile flooring, natural gas heating, kitchen pantry, glass shower doors, gas fireplace with black slate surround, recessed lighting, Kenmore appliances, covered entry, copper wiring and much more. Life in this part of Virginia Beach can be all you hoped for and more. The locale of this new construction development may be very appealing to professors and students as Virginia Wesleyan College is quite close as is private school, Norfolk Academy. Play a round of golf at Cypress Point Country Club. Shop at properties like Newtown Baker Crossing and the Town Center of Virginia Beach. A new home in Meadow Glen can let residents get anywhere they want in Hampton Roads without a bit of trouble. Looking at all of the perks that come with owning one of these new construction properties shows value still exists in today’s real estate market. Why live outside of the loop when you can be right in the middle? Don’t chance it; check into owning a new home in Meadow Glen today. Send me more information about communities similar to Meadow Glen. Our agents gladly offer FREE property tours of Meadow Glen, Virginia Beach and homebuyer consultations to all serious buyers.